If your parents were Shipwrecked, you’re old family friend rescued at the Presidio will be Lucky Jack Russell. He helps you recover the Spice and deliver it to the Frog Father. Then with the Frog Father’s blessing, he becomes a member of your crew. Lucky Jack is one of my favorite companions, so I’m excited it’s time for his first promotion. You can visit our Companion Guide to find a list of all the companions available to each Pirate class within the game. Or return to our Epic Promotion guides for Pirate101 Companions. When you first meet Lucky Jack he is a Dog Pirate. 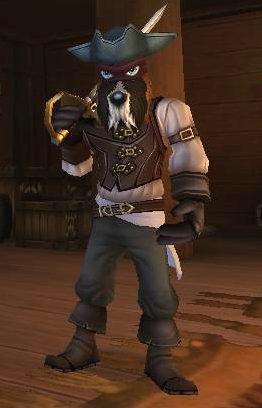 You can learn much more about his abilities and skills from Pirate101 Central. As you level up your companions they will occasionally reach epic promotion opportunities. Lucky Jack receives his first epic promotion when he is promoted to Level 21. In the Tavern he’ll tell you.. This quest will require you to have access to Monquista. Sail over to Flotsam and meet up with One-Eyed Jack. He’ll explain the news and send you on your way. 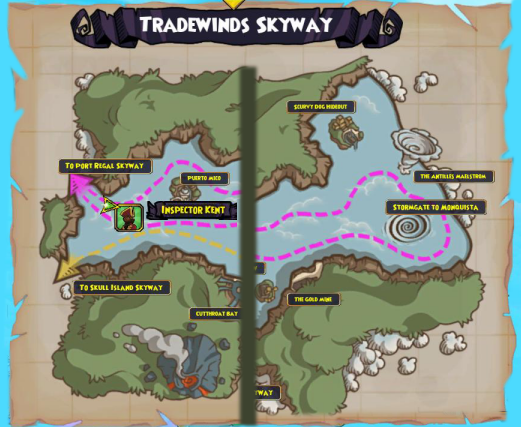 Sail off to the Scurvy Dog Hideout in the Tradewinds Skyway. 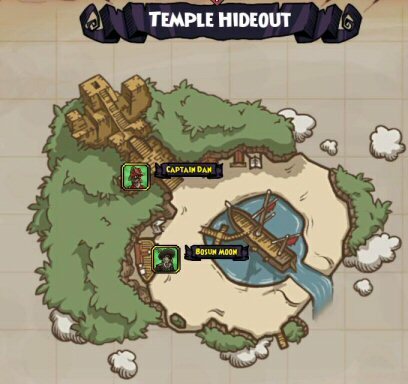 You’ll find Captain Dan in the Temple Hideout. Stay to the left edge of the beach and around to the steps at the pyramid and you should be able to reach Dan without a fight. When you meet up with Captain Dan he’ll tell you about the shining star of the Marleybone Royal Navy, Captain Gordon. Unfortunately there was an accident and Captain Gordon was taken prisoner by the Monquistans and fluttered off to Monquista. What’s worse, Captain Gordon is in possession of some very sensitive state secrets. If the Monkey’s coerce Gordon into revealing those secrets, it will lead to war. Off in Monquista, meet up with Gortez in the Rebel Fortress. Unfortunately Gortez knows nothing about a Marleybone prisoner. He suggests you “Hunt down Royal Squadron ships – they are the elite of the Monquistan Navy. Defeat the ships and seize any Dispatches you find.” When you acquire the Dispatches, bring them back to Gortez who will be able to decipher the messages for you. If you have been diligent in upgrading your ship and ship equipment, you should be able to handle the Monquistan Royal Navy and acquire the dispatches fairly easily. When you return to Gortez he will of course praise your prowess in Skyway battles and examine the papers you have brought. He tells you Captain Gordon is being held prisoner in Monquista City, in the Castelion Tower. Of course you can’t simply sail in and walk up to retrieve him. Gortez continues, “Unless… The simpering Royals are fools for paperwork. If you show the guards a proper Pass, they’ll let you in.” The problem is, Gortez cannot forge these kinds of papers and suggests you speak with Queen Eleanor. Eleanor knows a way to acquire the papers you need. She will direct you to head off to across the skyway and speak with a monk at the Abbey. Head over to Saint Bonobo’s Abbey and speak with Librarian Cuvello. He will tell you how to speak with Cardinal Augustino and acquire the papers you need. It seems in his younger days Augustino had some controversial ideas and he wrote about them extensively. Today those views would be considered heresy! The Cardinal has tried to recover his writings from the great libraries in the Holy City, but of course there are some that remain. Cuvello will give you a letter to take to Augustino’s attendant, Monsignor Levara. Levara of course is indignant of your presence. It takes a little persuading from Lucky Jack for the Monsignor to give you the papers you need. With those in hand, head over to Monquista City and enter the prisoner Tower. 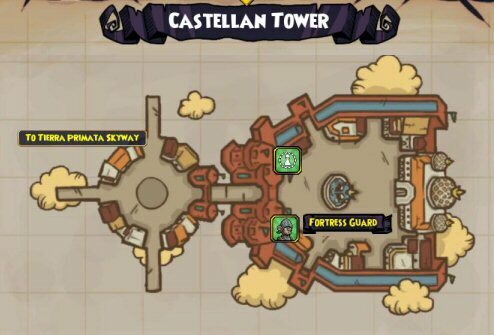 The Tower is right inside the gates of the city to your right. Hand the door guards your pass and you’ll gain entry. Now the papers aren’t going to get you Captain Gordon. They will get you into the Tower, but you’ll still have to battle Fortress Guards to free the Marleybonean. 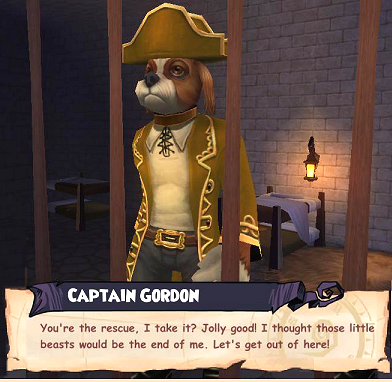 Rescuing Gordon is nearly the same battles you went through in the Presidio to rescue Lucky Jack. Take care of the guards and release Gordon from his cell. With the Captain rescued, hurry out of Monquista and back to the Tradewinds Skyway. When you first met with Captain Dan, he instructed you to take Gordon to the HMS Vigilant at the passage to Port Regal. Inspector Kent will also give his praise to you and your crew. He’ll also reward Mr. Russell with a medal of Congratulations for serving his homeland of Marleybone. Now to a Tavern with you! The nearest Tavern will be over in Scrimshaw. Head on over there to celebrate your good deed! 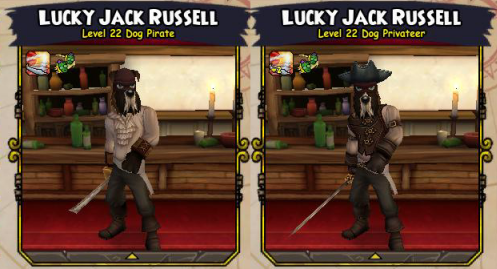 With that Lucky Jack Russell will be promoted to a Dog Privateer! Jack’s next promotion will come when he reaches level 47. 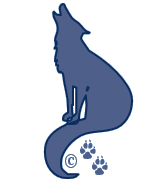 At this level he will take the opportunity to become a Dog Corsair. My Lucky Jack has a bit farther to go before he reaches this level. But as soon as he does, I’ll update his Quest page. This entry was posted on November 9, 2013, in Game Guides and tagged companion, game guides, game hints, games, Jack, Kid friendly, kid safe, locations, lucky, online, Pirate101, Pirates, promotion, quests, role play, russell, Skyways, spells, Windlanes. Bookmark the permalink.